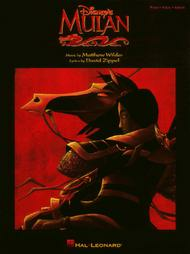 Mulan composed by David Zippel and Matthew Wilder. Arranged by Johnnie Vinson. For Concert Band. Score and full set of parts.. Young Concert Band. Grade 3. Published by Hal Leonard (HL.4000696). Mulan for Guitar, Piano/Keyboard, Vocal. Piano/Vocal/Guitar Songbook. Disney and Movies. Difficulty: medium. Songbook. Vocal melody, piano accompaniment, lyrics, chord names, guitar chord diagrams and color illustrations. 56 pages. 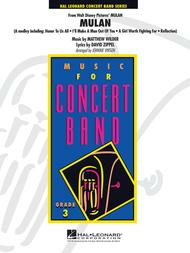 Published by Hal Leonard (HL.313099).ISBN 0793593085. With vocal melody, piano accompaniment, lyrics, chord names, guitar chord diagrams and color illustrations. Disney and Movies. 9x12 inches.This collection includes six songs with music by Matthew Wilder and lyrics by Tony Award-winner David Zippel. Also features lavish full-color illustrations from the film.